On Saturday 21st August 2004 at the Athens Olympic Games, Matthew Pinsent CBE entered Olympic history. In one of the classic sporting moments of all time, he led the Great Britain coxless four to victory over the Canadian World Champions by only eight one hundredths of a second. 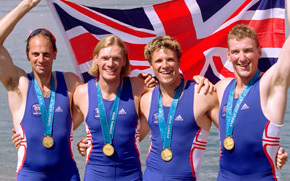 The GB crew of Matthew, James Cracknell, Ed Coode and Steve Williams competed for the lead with Canada throughout the 2000 metre race and with 200 to go the Canadians took the lead. However, in traditional fashion Matthew increased the stroke rate and the British boat clawed back the lead to win by inches. At the end neither crew knew who had won until the roar of the British supporters confirmed victory. In the aftermath, Matthew was emotionally and physically drained. After a year of highs and lows, it was the perfect response to the doubters who had wondered if Britain could win and if Jurgen Grobler had made a mistake putting Matthew and James Cracknell in the coxless four. Matthew is now one of only 5 athletes to win 4 consecutive Gold medals. In 1992 Matthew graduated in Geography from St Catherine's College, Oxford, where he was President of the Oxford Rowing Club. He took part in the Oxford and Cambridge Boat Race in 1990 and 1991, when Oxford beat Cambridge by substantial distances. Also in 1992, at the age of only 21, Matthew had his first taste of Olympic success, when in a Coxless Pair with partner Sir Steve Redgrave, he won the Gold Medal at the Barcelona Olympics. Prior to that Olympic win he and Redgrave had enjoyed an unbeaten international season, and it was already obvious that Matthew was developing to become one of the world's greatest oarsmen. At the Atlanta Olympics in 1996 the Pinsent/Redgrave duo won another Gold Medal and throughout the nineties their outstanding combination also brought them Seven World Championship Gold's. Their unbroken run of successes continued through to the Millennium Olympic Games in Sydney when Pinsent, again with Redgrave (now in a Coxless Four with James Cracknell and Tim Foster) again triumphed earning Pinsent his THIRD Olympic Gold Medal. "THE RACE" in which he did it was voted 'Britain's Greatest Sporting Moment' and the crew secured themselves a very special place in the heart of the nation. After Sydney, Matthew formed a seemingly invincible Coxless Pair partnership with James Cracknell MBE. Undefeated throughout 2001, they went on to complete a unique feat in the history of rowing, by winning the Coxless Pair at the World Championships in Lucerne, a mere two hours after winning the Coxed Pairs. In the 2002 World Championships in Seville they defended their Coxless Pairs title, beating an experienced Australian crew who had beaten them in Lucerne earlier in the year and breaking the world record by 4 seconds in the process. Last year an extremely uncharacteristic "bad day at the office" in the World Championship final meant that for the first time in 11 years Matthew ended the year without a gold medal. Although he has never needed any extra motivation, the 2004 victory was particularly sweet given the year he had endured. The crew dedicated their boat and race to Alex Partridge whose freak injury in July denied him from being part of the Four. Their performance was the perfect response. Matthew is an outstanding motivational and after dinner speaker. He has appeared at corporate events for some of our most prestigious companies such as Procter & Gamble, IBM, British Telecom, NatWest, Camelot and Lombard. 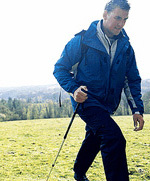 Matthew was awarded the MBE in the 1993 New Year's Honours List and the CBE in the New Years Honours list 2000. He married Demetra in October 2002. Matthew is now taking some time to reflect on his future. He has undoubtedly sealed his name amongst the greatest Olympians of all time. His autobiography, "A lifetime in a race", which he has written himself is published on 2nd September 2004 and whatever the future holds, Matthew will no doubt be at the forefront of any career, whether it be in rowing, sport, business or the media.